Also known as Red Mosquito Larve, your discus, eels, betas, loaches, and other community freshwater fish will love this treat. These are a great choice for community tanks. 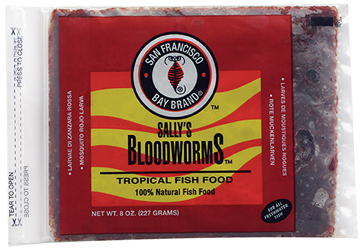 Bloodworms are a natural product that may cause allergic reaction in some people. All Freshwater Angels, Discus, Barbs, Cichlids, Gouramis, Live Bearers, Loaches, Eels, Catfish, Tetras, Sharks & Silver Dollars and all Saltwater Angelfish, Butterflyfish, Damsels, Clownfish, Groupers, and Eels.